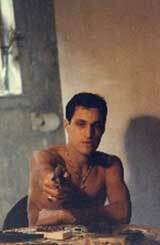 While living in his Elizabeth St. apartment, young Vincent Gallo made this beautiful mosaic tabletop by hand in 1979. A circular wood base covered meticulously with tiles in a floral motif. Featured in his film The Gunlover. Signed by Vincent Gallo. This tabletop was a prominent piece in his New York apartment on Elizabeth Street, and was the only thing Vincent Gallo left with when he moved out in March-2005. Letter of authenticity available with purchase. *Buyer pays actual shipping fees, which will be billed separately. Full shipping insurance required to complete sale.